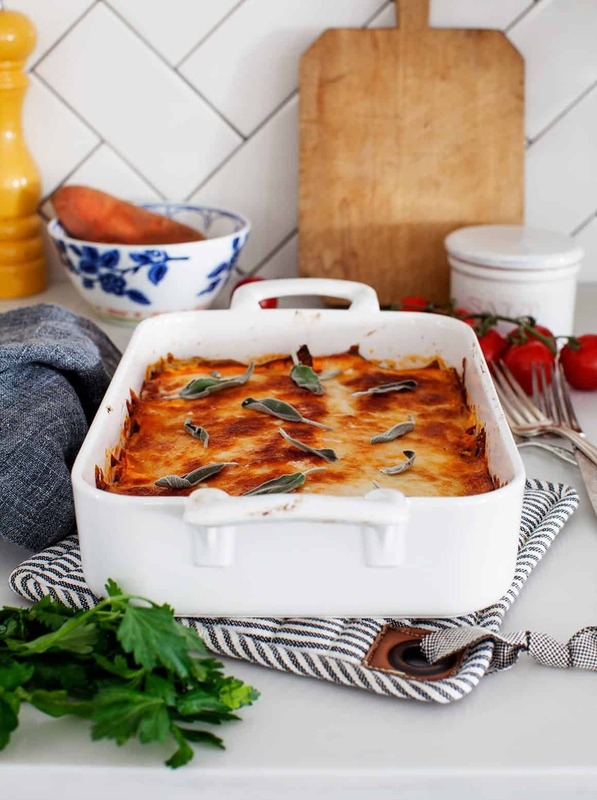 Layers of sweet potatoes are used in place of regular lasagna noodles in this vegetarian lasagna. Make this for dinner on a cold winter night! Gluten Free. In a medium bowl, mix together the ricotta, feta, garlic, basil, sage, red pepper flakes and a few generous pinches of salt and pepper. Lightly grease an 8x8 or similar size baking pan with olive oil. (Pictured is a 7x10 inch pan) Spread the marinara sauce over the bottom of the baking dish and top with the first layer of sweet potato slices. Spread with half of the ricotta cheese mixture and add a layer of 1 cup baby spinach. Add the next sweet potato layer, the remaining ricotta cheese, and the remaining spinach. Top with the last layer of sweet potatoes, the shredded mozzarella, and the Parmigiano cheese. Bake for 35 minutes, uncovered. If cheese starts browning too much, cover the pan with a sheet of aluminum foil. Add the remaining fresh sage during the last minute of baking time. Remove from the oven and let sit for 15 minutes before slicing. Sprinkle with parsley, if using. note: If your sweet potatoes are not paper thin, you will need to increase the baking time in order for them to become tender (and cover for half of the total baking time). another note: This lasagna is not very tall after it bakes since the vegetables cook down a bit. 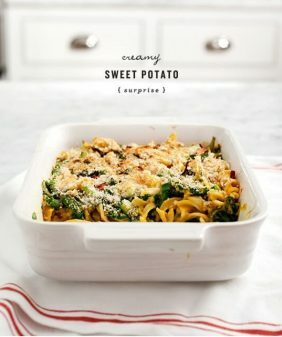 This yielded 4 large servings for us (or 6 smaller servings) - if you want to bulk this up and increase the serving #, you could add 2 layers of regular lasagna noodles in addition to the sweet potato layers. 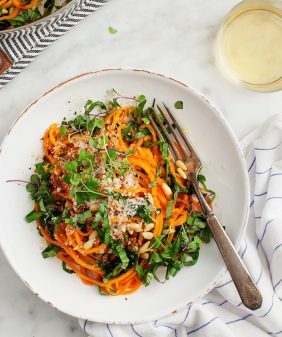 Those sweet potato “noodles” are STUNNING! 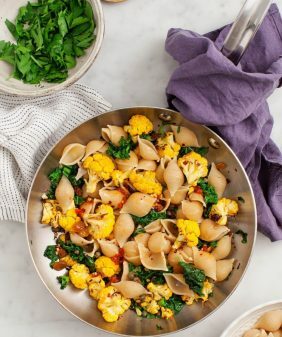 awesome idea, I always use butternut squash for noodles and tofu/cashew ricotta ’cause… I’m vegan!Us (planet/animals). I’m probably and “ethical” vegan, since I didn’t have any health reasons to change my diet. Just facts and science. But, as I have said before, follow this blog for its genuine talent and universal approach to wonderful food cooked by real people. Bring it on! I can veganize your recipes and maybe, one day, I’ll veganize you! What an inspired twist on a classic! So enchanted I went straight to Macy’s this morning to buy attachment; will be making on New Year’s Day! Wish me luck, yours is perfection! What a great idea!!! 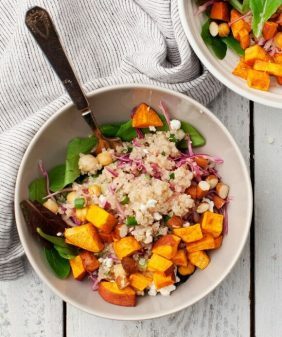 i love the use of sweet potato instead of pasta sheets – much more healthy and I even think it would be more delicious ♥ Will definitely try it soon! My sister and I made this tonight and it is amazing! I had to demonstrate self control! This is brilliant! I can’t wait to give it a try. 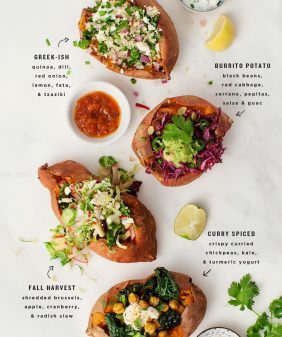 Holy heavenly sweet potato! This looks amazing! Can’t wait to try! Any ideas or suggestions for making the noodles if you don’t have a Kitchenaid Mixer and attachment? 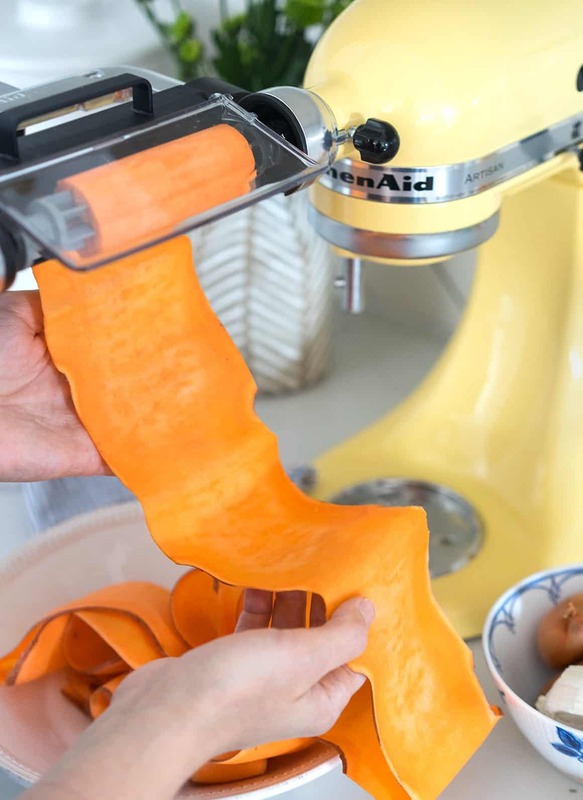 Hi Anna, slice them as thin as you can (either lengthwise into planks or it might be easier to slice them thinner into circles), and then bake it a little longer so that the sweet potatoes get soft enough. Hope that helps! I just made this tonight and it’s amazing! It took me a while to figure out how to work the attachment but I don’t see me going back to regular noodles. Thanks for sharing this recipe! I made this and love it and will make it again! 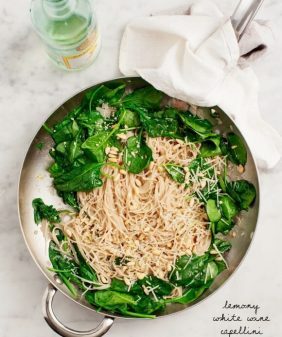 I could live off sweet potatoes and spinach but don’t really care for pasta so this this is a perfect dish! Thanks again! Has anyone attempted to make ahead and freeze? Curious how it stands up… thanks! For anyone interested it took me 1hr to cook the thicker handcut potato dish. Covered with foil half the time. This is such a great winter dish, especially if you want a pasta alternative! Even my boyfriend who doesn’t love sweet potato like this dish. I don’t have the kitchen aid attachment so I used a mandoline at 1/16 and it was perfectly thin and still cooked in 30 minutes! Hi Melissa, I’m so glad you both loved it! Thanks for the tip about the mandoline!